The Structural Design of Tall and Special Buildings, Accepted on Apr. 6, 2016. In recent years, a combination of rapid construction of supertall buildings and frequent occurrence of strong earthquakes worldwide demands a rational seismic design method for structures of this kind. Although earthquake-induced collapse analysis is one of the most efficient methods to quantify the collapse resistance of buildings, little research has been reported on using the collapse analysis to evaluate the seismic safety of supertall buildings during the design stage. To optimize the design taking into account earthquake-induced collapses, a real world supertall building with a height of greater than 500 m is investigated in this work. Throughout its design procedure, earthquake-induced collapse analyses are performed to optimize the design at three different levels (i.e., the structural system level, design parameter level and component level). At the structural system level, the influence of different lateral force resisting systems on the collapse resistance is discussed; at the design parameter level, the influence of minimum base shear force is discussed; and at the component level, the influence of high-performance shear wall on the collapse resistance is studied. Based on these discussions, the optimal design scheme of the building is established to improve the seismic safety while maintaining the cost of construction. Given more and more supertall buildings will be constructed with new structural system and components, this work will provide important references for the seismic design of supertall buildings and the corresponding collapse resistance research in the future. Tall buildings are important symbols of construction technology and economic development of a nation. The Council on Tall Buildings and Urban Habitat (CTBUHa) defines ¡°supertall¡± as a building over 300 m in height. Statistics show that until March 2015, there are 108 completed or under constructed supertall buildings exceeding 300 m worldwide. In the next five years, the number of supertall buildings that are higher than 300 m will be doubled to 246, and the maximum building height will exceed 1000 m (the Kingdom Tower in Saudi Arabia) (CTBUH, 2015a). In short, supertall building construction has entered a period of vigorous development. Meanwhile, strong earthquakes continue to happen frequently all over the world. The China Wenchuan Earthquake in 2008, the Chile Concepci¨®n Earthquake in 2010, the Japan Tohoku Earthquake in 2011 and the Nepal Earthquake in 2015 are just a few examples. All of these catastrophes caused enormous casualties and property losses. Thus, earthquakes are serious threaten to tall buildings, especially to many new supertall buildings located in high seismic region. Due to the comprehensive function, dense population and long service life of supertall buildings, the earthquake-induced collapse will lead to unacceptable economic losses and casualties. Therefore, the collapse of supertall buildings due to extreme earthquakes must be prevented through a rational and effective seismic design. The structural system of a supertall building is very complex. A large number of new structural systems and high-performance structural components are adopted in the newly constructed supertall buildings. However, the seismic performance of these new systems and components has not yet been sufficiently studied. Consequently, their design philosophies and methods are also not comprehensively specified in the building codes. In addition, because the fundamental periods of supertall buildings are much longer than the other conventional structures, the applicability of certain design specifications (e.g., the minimum base shear force) in the design codes has not been verified for supertall buildings. Therefore, how to propose a rational seismic design method to ensure the structural seismic safety is the primary objective of seismic design for supertall buildings. As a new form of architecture, very few supertall buildings have experienced very strong earthquakes. Meanwhile, for supertall buildings with heights over several hundred meters, studying the seismic collapse resistance by means of shaking table tests is both difficult and impractical. As a consequence, the numerical methods especially the earthquake-induced collapse analysis has become one of the best choices to directly determine the relationship between the design parameters and structural seismic safety. At present, FEMA P695 has proposed the framework using the collapse analysis to guide the seismic design of structures (FEMA, 2009). The structural collapse fragility curve and collapse margin ratio (CMR) can be obtained through the incremental dynamic analysis (IDA). 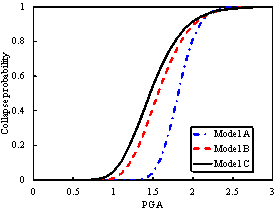 Subsequently, the reliability of code-specified seismic performance factors including response modification coefficient, system overstrength factor, and deflection amplification factor can be quantified. Nevertheless the existing work using collapse analysis mainly focuses on the collapse resistances of ordinary structural systems, such as timber structures (FEMA, 2009), concrete or steel frames (Zareian and Krawinkler, 2007; Tavafoghi and Eshghi, 2013; Sengupta and Li, 2014; Akbas et al, 2014), shear wall structures (Cengiz and Saygun, 2007) and so on. Little research has been reported on using collapse analysis to ensure the seismic safety of supertall buildings during the design stage. Based on the above background information, a real world supertall building with a height of greater than 500 m is investigated in this work. Throughout its design procedure, the earthquake-induced collapse analyses are performed to optimize the design at different levels: (i.e., the structural system level, design parameter level and component level). Specifically, at the structural system level, the influence of different lateral force resisting systems on the collapse resistance is discussed; at the design parameter level, the influence of minimum base shear force is discussed; and at the component level, the influence of high-performance shear wall on the collapse resistance is studied. Based on these discussions, the optimal design scheme of the studied building is established to improve the safety while maintaining the cost of construction. Note that although the collapse analysis has been performed in the seismic design of ordinary buildings, a systematic collapse analysis to guide the seismic design of supertall buildings is very rare. As a result, this work will provide important references for the seismic design of similar supertall buildings and the corresponding collapse resistance research in the future. The building concerned is a supertall structure located in Beijing and its architectural drawing is shown in Figure 1, featuring the shape of a Chinese traditional wine cup. The planar layout of the building is approximately square with the largest dimension located at the bottom. The size of the planar layout decreases gradually along the height of the building. The minimum planar layout is located at the height of approximately 400 m, above which it begins to increase again until reaching the top. Note that the dimension of the planar layout at the top is still smaller than that at the bottom. It is a multifunctional building with a total height of 528 m. It has 7 stories underground and 108 stories above the ground. The gross floor area of this building is approximately 420,000 m2. It will become the tallest building located in the high seismic region in China as well as in the world. The high seismic region is referred to as ¡°8 degree seismic design zone¡± by the Code for Seismic Design of Buildings (CMC, 2010a) of China. The maximum spectral acceleration at the Maximum Considered Earthquake (MCE) level is about 0.9g (g is the acceleration of gravity) and the building site is classified as Class II (i.e., an equivalent shear-wave velocity of 360 m/s for 30 m soil (VS30)). Based on such information, the acceleration spectrum at the MCE level can be obtained according to the Chinese design code (CMC, 2010a) and shown in Figure 2. The wind loads with a return period of 50 years and 100 years are 0.45 kN/m2 and 0.5 kN/m2, respectively. Preliminary analysis indicates that the story shear force is dominated by the seismic load; this guides the subsequent study which focuses on the earthquake-induced structural safety of this supertall building. It is noted that the experience of designing such a supertall building in highly seismic regions is very limit worldwide. In addition, the architectural layout, the lateral force resisting system (mega column/core tube/brace system) and the component types of the building concerned are significantly different from the ordinary buildings. As such, the collapse resistance of this supertall building is studied throughout the design procedure by performing earthquake-induced collapse analyses. This will in turn ensure the seismic safety of this building. Generally, supertall buildings consist of a large number of components in different types. In addition, the stress states of these components are also very complicated. In the supertall building concerned, the main structural components include concrete filled steel tube (CFST) mega columns, shear walls, mega braces, outriggers, circle belt trusses and secondary steel frames. Therefore, based on the modeling approach for supertall buildings proposed by Lu et al. (2011; 2013a,b), the finite element (FE) models of this building with different design schemes are established. Details of these FE models are as follows. The fiber-beam element is adopted to simulate the CFST mega columns (Lu et al, 2013a). Both the external steel tube and the filled concrete are divided into a number of fibers. Different fibers adopt different constitutive material models. The constitutive model of CFST proposed by Han et al. (2001) is used for the confined concrete (Figure 3(a)). 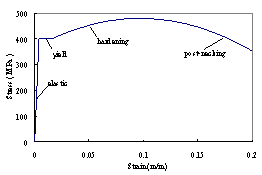 The von Mises yield criterion-based plastic constitutive model (Lu et al, 2013b) is used for steel, and the typical stress-strain backbone curve shown in Figure 3(b) contains four stages, including elastic, yield, hardening and post-necking. The secondary frames, circle belt trusses, outriggers and mega braces of the building are constructed of H-shaped or welded box-shaped steel beams. The fiber-beam element is also used to model these components (Lu et al, 2011; 2013a,b). The shear walls and coupling beams in the core tube are simulated by the multi-layered shell elements (Guan and Loo, 1997; Lu et al, 2013b; 2015a). According to the actual reinforcement arrangement in the shear wall, the multi-layered shell element is divided into approximately 21 concrete or steel reinforcement layers in the wall thickness direction. The longitudinal and transverse rebars are smeared into equivalent steel layers. For the boundary zones of the shear wall, the concentrated reinforcing bars are simulated using beam elements, which are embedded in the shell elements by nodes sharing 0 . Existing studies show that such a modeling approach can successfully represent the nonlinear seismic behavior of supertall buildings with acceptable modeling and computing workload (Lu et al, 2011; 2013a,b). Collapse is a very complicated process in which the structural components exceed their load or deformation capacities and the entire structure changes from a continuum system into discrete parts through the facture of the structural elements. The key issue to successfully simulate the earthquake-induced collapse is to properly simulate this phenomenon. At present, much research have been conducted on the collapse simulation using four types of methods: finite element method (Lu et al, 2012; 2013b; Burton and Deierlein, 2013; Qian and Li, 2014; Lignos et al, 2011; Mahin et al, 2015), discrete element method (Sun et al, 2003; Gu et al, 2014), applied element method (Worakanchana and Meguro, 2008; Salem 2011) and rigid body method (Mattern et al, 2007). In addition, Sivaselvan and Reinhorn (2006) also have developed a mixed Lagrangian approach to simulate the structural collapse. Although the above mentioned numerical methods have been successfully adopted for the simulations of structural collapse, most of such simulations focus on the collapse of ordinary buildings, such as multi-story frames and masonry buildings. Limited collapse simulation has been conducted for supertall buildings. Based on the FE method, the authors have proposed the elemental deactivation technique in their previous studies (Lu et al, 2013b) on earthquake-induced collapse simulation. The material-related failure criterion (i.e. material strain) is adopted to monitor the failure of structural elements. Specifically, the strains of the elemental integration points of the whole building are monitored. If the strain at any integration point in a fiber or layer (either concrete or steel) exceeds the material failure criterion, the stress and the stiffness of this specific fiber/layer are considered to be deactivated, which means that the fiber/layer can no longer contribute to the stiffness computation of the whole structure. If all fibers/layers of an element are deactivated, the element is considered fully deactivated from the model. The proposed method has been successfully applied in the earthquake-induced collapse simulations for two supertall buildings that are higher than 500 m (Lu et al, 2011; 2013a). These applications fully demonstrate the feasibility of the proposed method in simulating the earthquake-induced collapse of supertall buildings. In addition, most of the widely used structural design software (e.g., ETABS) adopts the FE model consisting of beam elements and shell elements to analyze the mechanical behavior of supertall buildings. Such design models can be readily transformed to the collapse simulation in this work, which will greatly improve the analysis efficiency. For the above reasons, the collapse simulation method proposed by Lu et al. (2011; 2013a,b) is adopted herein to investigate the earthquake-induced collapse of the supertall building concerned. (1) These failure criteria are based on the specifications given in the design codes, which are widely accepted by design engineers, especially for the design of this real world supertall building. (2) The major objective of this work is to identify the optimal seismic design according to the relative collapse resistances of different design schemes. The elemental failure criteria may affect the collapse resistance of one specific scheme, but will not change the relative relationships of collapse resistance among these schemes if the earthquake-induced collapse analyses are performed with the same values of the failure criteria. Therefore, as long as the same values of the elemental failure criteria are used to perform the earthquake-induced collapse of all of the design schemes, the optimization schemes still can be identified. Due to the height of the supertall building, its structural responses are more sensitive to the lateral loads (wind and seismic loads) than those of the ordinary frames or shear wall structures; in most cases the design of a supertall building is dominated by the lateral stiffness (Moon, 2014). Therefore, choosing a reasonable lateral force resisting system has a great influence on the cost and safety of supertall buildings. CTBUH (2015b) has conducted an investigation on the lateral force resisting systems of 75 supertall buildings constructed between 1961 and 2010 worldwide. They include 20 framed-tube buildings, 4 bundled-tube buildings, 15 tube-in-tube buildings, 10 diagonalized buildings, 19 mega column/core tube/outrigger buildings and 7 mega column/core tube/brace buildings. The statistics also indicate that the framed-tube, bundled-tube and tube-in-tube structures are mainly applied in the tall buildings lower than 90 stories. 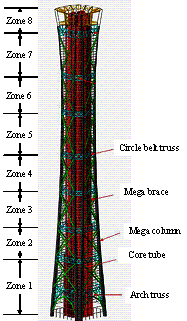 Among the 15 supertall buildings constructed between 2001 and 2010, 11 adopted the mega column/core tube/outrigger system and 3 adopted the mega column/core tube/brace system. Conclusively, the mega structural systems (e.g., the mega column/core tube/outrigger system and mega column/core tube/brace system) have become the best choice for the lateral force resisting systems of modern supertall buildings. Consequently, the supertall building studied herein also adopts such a mega structural system. In August 2011, two design schemes with different lateral force resisting systems are proposed at the preliminary design stage according to the requirement of architectural features. The differences of these two schemes are briefly described as follows. The first scheme is referred to as the ¡°half-braced scheme¡±. The lateral force resisting system at the lower four zones involves mega columns, core tube and mega braces; while in the upper four zones, the mega columns, core tube and outriggers are adopted as the main lateral force resisting system, as shown in Figure 4(a). The mega columns, located at four corners, are constructed by CFST and their cross sections decrease along the building height. Each mega column at the corner is separated into two columns from Zone 2 and extends to the top of the building. The mega braces are arranged at the periphery of the building between Zone 1 and Zone 4. For the upper four zones, closely spaced perimeter columns are used instead of mega braces. Nine circle belt trusses are arranged along the building height at 13 to 15-story intervals. The outriggers are built between Zone 5 and Zone 8. The other design scheme is referred to as the ¡°fully-braced scheme¡± and the main lateral force resisting system includes mega columns, core tube and mega braces, as shown in Figure 4(b). 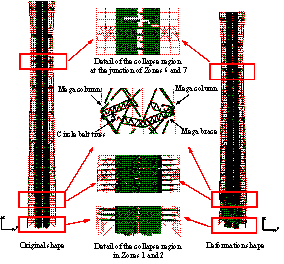 The mega columns are also constructed by CFST and the layout of the mega columns is similar to the half-braced scheme except for the following two differences: (a) Each corner has two mega columns; (b) the mega columns only extend to the top of Zone 7. Zone 8, which is a sightseeing region, has no mega column. The mega braces are arranged throughout the building height. The number of circle belt trusses is reduced to eight comparing to the half-braced scheme. The core tube of the fully-braced scheme is similar to the half-braced scheme. The fundamental vibration periods of the half-braced and fully-braced design schemes are 7.44 s and 7.38 s, respectively. This implies that the lateral stiffness of the fully-braced scheme is larger than that of the half-braced scheme. The material consumption of these two schemes is compared in Table 2. Note that both design schemes are for the preliminary design phase, therefore only the concrete and steel consumptions of the main structural components are calculated and compared; whereas the material consumption of non-structural components is not considered. The comparison shows that the total material consumption (concrete and steel) of the fully-braced scheme is 11.19% less than that of the half-braced scheme. This is mainly because the mega columns and shear walls in the fully-braced scheme have smaller cross sections, which results in a reduction of 13.44% in concrete consumption. The steel consumption of the two design schemes, on the other hand, is very similar. Specifically, the steel consumption of the mega columns in the fully-braced scheme is 17.68% less than that of the half-braced scheme; while the steel consumption of the mega braces increases 13.04% comparing to the half-braced scheme. Consequently, the total steel consumption of the fully-braced scheme is only 3.16% larger than that of the half-braced scheme. Overall, although the mega braces in the fully-braced scheme result in a larger steel consumption, due to more uniform lateral stiffness in the fully-braced scheme, the cross sections of other components have been reduced and in turn resulted in a similar amount of the total steel consumption of these two design schemes. In addition, the total mass of the fully-braced scheme is smaller than that of the half-braced scheme. Although the fully-braced scheme is advantageous in material consumption, the seismic performances and collapse resistances of these two design schemes need to be further studied. The seismic performances of the two design schemes are comprehensively compared through nonlinear time history analysis (THA) using different ground motions at various intensities. The seismic responses of the two schemes subjected to the widely used ground motion records, El-Centro EW 1940, are illustrated herein as typical cases. The PGA of the El-Centro EW 1940 ground motion record is scaled to 400 cm/s2, 510 cm/s2 and 620 cm/s2, which correspond to the MCE level ground motion of the seismic design intensities of 8, 8.5 and 9 degrees, respectively, as specified by the Chinese code (CMC, 2010a). The classical Rayleigh damping is adopted with a damping ratio of 5% in the nonlinear THA. Note that the design intensity of this building is 8 degree. However, given the special functionality and importance of this supertall building, stronger ground motions are considered as the seismic input for the structure to evaluate the performance of the building subjected to extreme earthquakes. The envelopes of story drift responses of the two schemes are shown in Figure 5. It indicates that the story drift ratio in the lower four zones is uniform and has no significant difference between the two design schemes. Meanwhile, the story drift ratio in the upper zones of the fully-braced scheme is slightly smaller than that of the half-braced scheme; and this trend increases with the increase of earthquake intensity. At the top of the building, the story drift ratio of the fully-braced scheme is larger than that of the half-braced scheme. This is because the top three stories of the fully-braced scheme are the sightseeing region. Hence, fewer lateral force resisting components are allowed in this region according to the requirement of the architectural function. Correspondingly, the lateral stiffness of this region is relatively smaller than that of the other zones. In addition, the story drift ratio in the upper zones of the half-braced scheme has significant reductions at the location of each circle belt truss. This phenomenon is due to the arrangement of the outriggers between Zone 5 and Zone 8, which significantly enhance the local structural stiffness and hence decrease the story drift ratio. Generally, the seismic responses at the MCE level of the two design schemes are very similar and the nonlinear THA does not distinguish one scheme better than the other. Hence, earthquake-induced collapse analysis based on IDA is necessary to be performed to evaluate the ultimate collapse resistance of the two design schemes. Due to the absence of the site-specified ground motion records at the preliminary design stage, the widely used 22 far-field ground motion records suggested by FEMA P695 (2009) and the El-Centro EW 1940 ground motion are adopted as the basic seismic input for the following two considerations. (1) This work focuses on the relative collapse capacity between the half-braced and fully-braced schemes in order to identify the better design. For this reasion, the seismic input of these two designs are kept the same, thereby the relative collapse capacities of these two buildings can be obtained and differentiated; yet, the absolute seismic performance of each design may not be as so accurate. Note that, at the final design stage, a more accurate ground motion record set, which matches the site-specified spectrum, has been adopted to further assess the seismic performances of the improved designs. (2) Although the 22 far-field ground motion record set is primarily intended for buildings with natural (first-mode) periods less than or equal to 4 seconds, FEMA P695 (2009) also indicates that most records obtained from the newer seismographs are typically accurate to at least 10 seconds. As such, most records in far-field and near-field record sets are accurate to a period of at least 10 seconds. The fundamental periods of the two buildings are 7.44 s and 7.38 s, which are within the range of 10 seconds. Hence, the reliability of the evaluated seismic performances by 22 far-field ground motion record set is considered acceptable at the preliminary design stage. The earthquake-induced collapses of these two design schemes subjected to extreme earthquakes are conducted using the proposed method presented in Section 2.3. And a typical earthquake-induced collapse process of the fully-braced scheme subjected to El-Centro EW 1940 ground motion with a PGA = 2058 cm/s2 is shown in Figure 6. At the initial stage when t = 2.055 s (Figure 6(a)), the coupling beams at the bottom of the core tube begin to fail due to shear. When t = 2.955 s (Figure 6(b)), the shear walls at Zone 6 begin to fail due to concrete crushing. When t = 10.810 s (Figure 6(c)), as the shear walls at Zone 6 have already been damaged severely, the internal forces are redistributed to other structural components. This results in gradually increased vertical and horizontal loads in the mega columns. 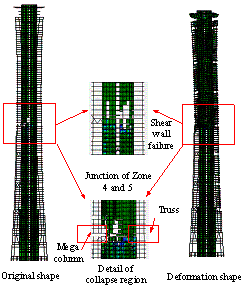 Subsequently, the mega columns at the top of Zone 6 begin to fail due to the combined overturning moment and compression. When t = 14.500 s (Figure 6(d)), the mega braces at Zone 6 begin to fail. 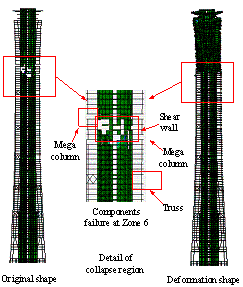 When t = 15.360 s (Figure 6(e)), most of the core tube, mega columns and mega braces are damaged in Zone 6 leading to the loss of the vertical load carrying capacity of the building. Consequently, the collapse of the whole building takes place. Meanwhile, large horizontal displacement responses of the upper zones induce an additional overturning moment due to the P-D effect. 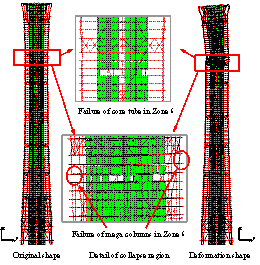 From the collapse process described above, the progress of structural failure generally follows: from the coupling beams at the bottom of the core tube, to the shear walls at Zone 6, then to the mega columns at Zone 6, and ﬁnally to the mega braces at Zones 6. In contrast, as discussed by Lu et al. (2013a), a different pattern of the collapse process was found for the half-braced scheme subjected to El-Centro EW 1940 ground motion, where collapse starts from the core tube at the bottom, then to the shear walls and coupling beams in the higher zones, and ﬁnally to the mega columns in Zones 1 and 2. The collapse modes of the two schemes subjected to the ground motion of El-Centro EW 1940 are compared in Figure 7. It clearly shows that the initial collapse region of the half-braced scheme occurs at the bottom of Zone 2. In addition, the junction of Zones 6 and 7 also exhibit severe damage. In contrast, the earthquake-induced collapse of the fully-braced scheme begins at Zone 6. Giving the randomness nature of earthquakes, different failure modes may be triggered by different ground motions. The collapse mode of the fully-braced scheme subjected to KOBE_SHI000 ground motion is also shown in Figure 7. 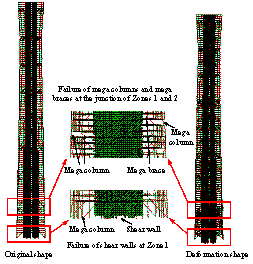 The collapse progresses as follows: failure is initiated from the coupling beams at the bottom of the core tube, then to the shear walls at Zone 3, subsequently to the mega columns at Zone 3, and finally to the mega braces at Zone 3, which is followed by the collapse of the entire structure. However, as described by Lu et al. (2013a), the collapse process of the half-braced scheme subjected to KOBE_SHI000 ground motion starts from the failure of shear walls at the bottom of the building. Subsequently, the mega columns and shear walls at Zone 2 are severely damaged. All these failures lead to the collapse of the entire building. The initial collapse regions of these two schemes subjected to the 23 ground motion records are shown in Figure 8. 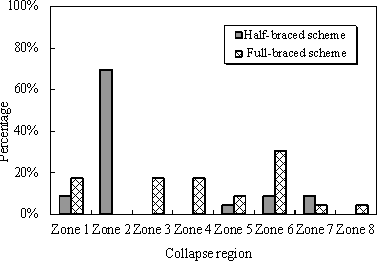 It is evident that Zone 2 is the main collapse region for the half-braced scheme and it accounts for approximately 69.57% of all the potential collapse regions. In contrast, the initial collapse regions of the fully-braced scheme are more uniformly distributed in each zone. Zone 6, which has the smallest planar layout, has a higher possibility to become the initial collapse region than the other zones. Such initial collapse regions can also be treated as the weakest points of the building when performing design optimization of the structural components. The collapse fragility curves for these two schemes are compared in Figure 9. Because of the complicated nature of ground motion records, the intensity measure (IM) may affect the shape of the fragility curves. The authors have previously discussed the rationality of different IMs for supertall buildings and proposed a more efficient IM as shown in Eq. (1) (Lu et al, 2013c,d). where Sa(Ti) is the spectral acceleration for the ith period; n is the number of the translational vibration modes to be considered; reflects the geometric mean of the spectral acceleration at the first n periods of the structure, which contributes the most to the structural seismic responses. The collapse fragility curves for the two design schemes using PGA and as IMs are shown in Figure 9. 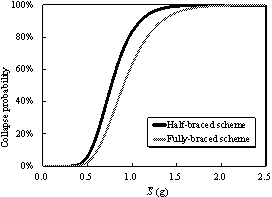 Generally, the collapse probability of the half-braced scheme is higher than that of the fully-braced scheme subjected to the same ground motion intensity. 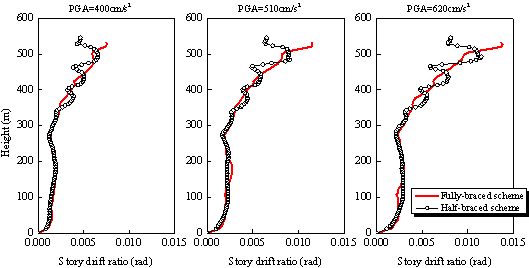 The dispersions of the fragility curves based on (Figure 9(b)) are significantly smaller than those based on PGA (Figure 9(a)). For example, the IM of each ground motion that triggers a collapse is recorded, which is referred to as ¡°IMcollapse¡± (e.g., ¡°PGAcollapse ¡± or ¡° ¡±). 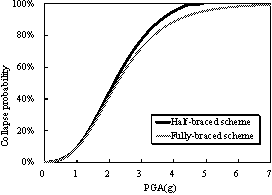 The coefficient of variation (COV) of PGAcollapse for the half-braced scheme is 0.426. In contrast, the corresponding COV of is only 0.282. Thus, is able to significantly reduce the dispersion of collapse resistances due to different ground motions. It should be noted that the Chinese building code adopts PGA to quantify the earthquake intensity, which is also popularly used in engineering practices. Note also that although different IMs will affect the dispersion of collapse resistances, they will not necessarily affect the relative collapse resistances of different design schemes. Therefore, PGA is selected as the IM to facilitate the following discussion in this work. The CMR proposed in FEMA P695 (2009) is adopted to quantify the structural collapse resistance capacity, which is defined by the following equation. where, IMCT is the ground motion intensity subject to which the collapse possibility is 50%; IMMT is the ground motion intensity corresponding to the design MCE level. For both design schemes, the PGA corresponding to the MCE level is 0.4 g as specified in the design code, and the PGAs inducing a 50% of the building collapse are 2.35 g and 2.70 g, respectively, for the half- and fully-braced schemes. Consequently, the CMRs of the two schemes are 5.88 and 6.75, respectively, according to Eq. (2). This evidently demonstrates that the fully-braced scheme has a relatively higher collapse resistance than the half-braced scheme. According to FEMA P695 (2009), the total system collapse uncertainty (bTOT) considered in this work is estimated to be 0.675. Thus, the CMR corresponding to a 5% collapse possibility at MCE level is 3.04 (FEMA P695 2009). Both the CMRs of the two design schemes readily meet this requirement. It is noteworthy that these CMRs don¡¯t account for the expected epsilon (e) for the building site and collapse hazard intensity. To slove this issuse, Haselton et al, (2011) and FEMA P695 (2009) suggested a simplified spectral shape factors (SSF) to get a more accurate CMR prediction (ACMR=SSF¡¤CMR, where ACMR is the adjusted collapse margin ratio). SSF depends on the building dynamic characteristics, inelastic performances and e parameters. Given that the e parameters are not provided in the seismic hazard map of China, it becomes problematic to compute the SSF and ACMR. Note that this work focuses on the relative collapse capacity between the half-braced and fully-braced design schemes. As the locations of the two buildings have the same site conditions, and both buildings have similar vibration periods, their SSF values are expected to be very close. Thus, the unadjusted collapse margin ratio can still be used to distinguish which design is a better one. Furthermore, the collapse probabilities of these two buildings at the MCE level earthquake are approximately 1.34% and 1.29%, respectively, for half-braced and fully-braced schemes. Clearly, such low collapse probabilities also meet the requirements of both ASCE 7-10 (i.e., < 6% at the MCE level for Risk Category III) (ASCE, 2010) and the Code for anti-collapse design of building structures of China (i.e., < 5% at the MCE level) (CAECS, 2015). Note that the fully-braced scheme exhibits a higher collapse resistance, having a CMR 14.8% higher than that of the half-braced scheme. Furthermore, the total material consumption of the fully-braced scheme is 11.2% lower than that of the half-braced scheme. As a result, the fully-braced scheme is suggested as the lateral force resisting system for the supertall building studied herein. Base shear force is one of the most important design parameters in seismic design. To ensure the structural seismic safety, a lower bound (minimum) of the base shear force (Vmin) has been specified in different international building codes (Lu et al, 2014). Both academic research and engineering applications indicate that during the seismic design procedure of supertall buildings, the base shear force calculated by the mode superposition method (Vt) is usually smaller than Vmin specified in the design codes (Lu et al, 2014; Wang et al, 2012), due to the long fundamental vibration period. A similar finding is also reached in this study. The minimum base shear force (Vmin) specified in the design code for the supertall building concerned is 0.024 G (CMC, 2010a), where G is the effective seismic weight. However, the calculated modal base shear force Vt is 0.0173 G, which is only 72% of Vmin. According to the Chinese building code (CMC, 2010a), for such a situation, the structural layout and the component dimensions should be modified to enhance the global lateral stiffness (which will reduce the structural vibration period and increase the calculated modal base shear force Vt). Although these measures are able to allow the modal base shear force to meet the code-specified requirement, it will also lead to a sharp increase in the material consumption (Lu et al, 2014). Consequently, the construction cost of the supertall building will be greatly increased. Therefore, an alternative and better strategy is necessary to be proposed to rationally adjust the base shear force to meet the minimum base shear force requirement. Since the building concerned is far beyond the maximum height of buildings specified in the building code (CMC, 2010a) and its occupancy importance is very high, a special advisory committee (referred to as ¡°the committee¡± hereafter) has been established to guide and monitor the seismic design. After a detailed discussion, two alternative adjustment methods of the base shear force are suggested by the committee. These two alternative methods, together with the method specified in the design code, in adjusting the base shear force are listed in Table 3, represented by three models (Models A, B and C). Specifically, the base shear force of Model A is adjusted according to the Chinese building code (CMC, 2010a). The component dimensions of Model A are increased to enhance the structural stiffness until the calculated base shear force meets the code-specified requirement (i.e., Vt ¡Ý Vmin). Subsequently, the story drift displacement evaluation and component design are conducted. In contrast, for Model B, as Vt < Vmin, the calculated shear force at each story using the mode superposition method Vt,i (i is the story number) is multiplied by Vmin/Vt to evaluate the story drift displacement and conduct the component design. For Model C, the calculated shear force at each story Vt,i is directly adopted for the story drift displacement evaluation; while the scaled force Vt,i¡¤Vmin/Vt is subsequently used to perform the component design. Consequently, the stiffness demand of Model B is slightly larger than that of Model C.
The analysis presented in Section 3 indicates that the CMR of this supertall building is too conservative at the preliminary design stage. The committee thus suggests that the sectional size and the strength of materials can be properly adjusted. Following such a suggestion, the typical components of Models A, B and C are given in Table 4. It can be seen that the dimensions of the mega columns, shear walls and circle belt trusses, as well as the steel ratio, of Model A are much larger than those of Model B and Model C. The mega columns of Model B are larger than those of Model C. The shear wall thickness and concrete strength of Model B are identical to those of Model C except that the reinforcement in the shear wall has a slight difference. The concrete compressive and steel yielding strengths, and the steel ratio of the mega columns of Model B and Model C are also identical. The other components in Model B and Model C also remain the same. The material consumptions of the lateral force resisting system in these three models are compared in Table 5. The comparison clearly shows that the material consumption of the mega columns in Model A is much larger than that of the other models. The concrete and steel consumptions of the mega columns in Model A are respectively 86.47% and 185.58% larger than those of Model B. The material consumption of the mega columns in both Models B and C is very similar. Model B consumes a little bit more concrete (10.44%) and steel (17.59%) than Model C.
For shear walls, the concrete consumptions of three models are very similar, while the steel consumptions demonstrate significant differences. The steel consumption of the shear walls in Model A is 116.40% larger than that of Model B. In contrast, the steel consumption of the shear walls in Model B is only 1.92% larger than that of Model C. Because the mega braces and circle belt trusses in Model B and Model C are identical, the steel consumption of these components is also identical. However, the steel consumption of the mega braces and circle belt trusses in Model A are 240.83% larger than that of the other two models. The above comparison demonstrates that Model A has the highest material consumption. The total concrete consumption of Model A is 45.03% larger than that of Model B, and its total steel consumption is 157.94% larger than that of Model B. Meanwhile, the total material consumption of Model B is slightly larger than that of Model C.
The fundamental vibration periods of Models A, B and C are also compared in Table 5. It clearly shows that the fundamental vibration period of Model A is smaller than those of Models B and C. Considering the greater material consumption and self-weight of Model A, the stiffness of Model A is significantly larger than those of Models B and C. Further, the fundamental vibration period and stiffness of Model B are slight larger than those of Model C.
To study the rationality of the three adjustment methods for base shear force (Table 3), the earthquake-induced collapse analysis is performed to determine the collapse resistance of the above three models. With progressing of the design, seven site-specified ground motion records suitable for this supertall building are provided by the Beijing Earthquake Bureau according to the building site condition. This ground motion set is selected and scaled to match the site-specified acceleration spectrum according to the Code for Seismic Design of Buildings (GB50011-2010) (CMC. 2010a). This ground motion selection procedure is similar to that suggested by PEER Tall building initiative (TBI 2010) except that some control parameters vary slightly. Among these ground motions, there are five natural ground motion records and two artificial ground motion records. 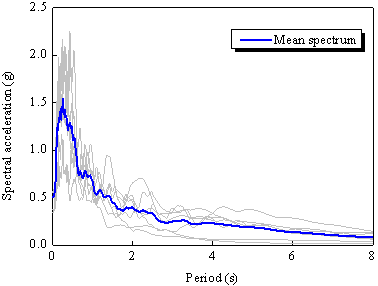 Their mean spectrums are shown in Figure 10. Hence, the seven ground motion records are also adopted as the basic seismic input for the collapse simulation. As mentioned above, the sections of the components are adjusted after the preliminary design, the CMRs calculated in this section is consequently smaller than those determined in Section 3. The initial collapse regions of the above three models are compared in Figure 11. It shows that the initial collapse regions of Model A are uniformly distributed along the building height. This suggests that Model A has no obvious weak regions. For Model B and Model C, their initial collapse regions are found to mainly concentrate in Zone 6, which has exactly the smallest planar layout. The strength and stiffness of this zone is relatively smaller than those of the upper and lower zones. Damage will be very likely to concentrate in this zone, so more attention should be paid on this zone in the subsequent designs. The fitted collapse fragility curves of the three models are shown in Figure 12. It indicates that Model A has an obvious higher collapse resistance than Models B and C when the ground motion intensity is relatively small. However, due to the much larger stiffness and self-weight of Model A than those of Models B and C, the increased seismic demand of Model A is higher than that of the other models when the ground motion intensity is increased. Correspondingly, the difference in the collapse resistances between the three models becomes small subjected to stronger ground motions. The CMRs of Models A, B and C are 4.53, 3.91 and 3.66, respectively. It clearly indicates that Model A has the highest seismic collapse resistance, which is followed by Model B and Model C. Note that all the CMRs of the three models are significantly greater than the acceptable value (i.e., 3.04) discussed in Section 3.4. In addition, Model B has a significantly smaller material consumption than Model A. The total concrete consumption of Model B is 68.95% as large as Model A; and the steel consumption is only 38.77% of Model A. Conclusively, Model B achieves an acceptable seismic collapse resistance with a reasonable level of material consumption. Therefore, taking into consideration both the structural safety and construction cost, the committee believes that Model B is deemed to represent the best base shear force adjustment method for this supertall building. In other words, if the modal base shear force is smaller than the code-specified minimum value, the calculated base shear force can be directly scaled to the minimum value for story drift displacement evaluation and component design. In the subsequent design and analysis, Model B is selected to be further optimized. Given that the supertall building concerned is functionally very important, higher seismic performance objectives, e.g., seismic resilience, must be considered. This requires that the supertall building possesses lower collapse probability, smaller seismic loss and quickly recovery ability. To achieve these seismic objectives, high-performance components are adopted in newly constructed supertall buildings. For this particular supertall building being studied, the brace-embedded shear wall is used to enhance its collapse resistance. However, such high-performance components will bring additional construction efforts and cost. Hence, the balance between the seismic performance and the additional construction cost due to high-performance components must then be carefully evaluated. Over a three-year period, the global structural design of the supertall building concerned has in principal been completed. In 2014, the building comes into the final component optimization phase. According to its architectural features, Zone 6 has rightly the smallest planar layout. However, Lu et al.¡¯s studies (Lu et al, 2011; 2013a) indicate that the seismic responses at the upper stories of a supertall building are sometimes larger than those of the other stories, because the contribution of high vibration modes is significant for this type of buildings. This suggests that the demand of seismic force in Zone 6 may not be smaller than the other zones. As a result, Zone 6 may become the potentially weak region and the damage is likely to concentrate in this zone. Such damage will significantly reduce the collapse resistance of the whole structure. In addition, Figure 11 also indicates that Zone 6 has the largest possibility to become the initial collapse region in Model B. Therefore, it is desirable to use effective seismic measures to enhance the seismic capacity of Zone 6. Much work have been conducted on the seismic performances of brace-embedded shear walls (Zhang et al, 2014; Lan et al, 2015), being a new type of high-performance component. Comparing to the traditional RC shear walls, the brace-embedded shear wall exhibits a higher strength and ductility. The committee suggested that the high-performance brace-embedded shear walls can be used between 78th and 95th stories in Zone 6 to increase the collapse resistance. To validate the effect of the brace-embedded shear walls on the collapse mode and resistance, the earthquake-induced collapse analysis is also performed herein. Two models with different shear wall arrangements are designed. For Model B1, traditional RC shear walls are used between 78th and 95th stories; for Model B2, brace-embedded shear walls are adopted. Note that in order to make full utilization of the bracing capacity, the V-shaped embedded braces are uniformly distributed in the external shear walls, as shown in Figure 13. These braces are simulated with individual steel fiber-beam elements that are embedded in the multi-layered shell elements for shear walls. The displacement compatibility between the shell elements and the embedded fiber-beams are achieved by nodes sharing. 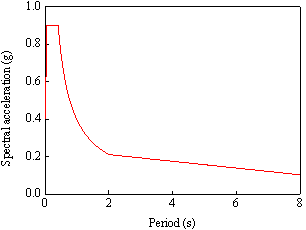 The vibration periods of these two models are compared in Table 6, with very similar values. This implies that the embedded braces in 78th-95th stories have little influence on the lateral stiffness of the structure and in turn the demand of the seismic force remains the same. The displacement responses of the two models subjected to the abovementioned seven selected ground motion records at the MCE level (i.e., PGA = 400 cm/s2) are shown in Figure 14. 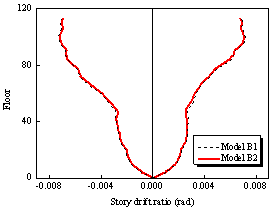 The story drift ratios of these two models are very similar and both meet the acceptance limit of 1/100 specified in the Chinese code (CMC, 2010a). Not being able to distinguish the advantages and disadvantages between these two designs, further collapse analysis is thus needed to quantify the collapse resistances of Models B1 and B2. The same seven ground motion records are also used for the collapse analysis, through which the typical collapse modes of Models B1 and B2 are compared in Figure 15. It shows that the collapse of Model B1 is initiated from the 85th story, which is the story without brace-embedded shear walls. In contrast, the collapse region of Model B2 is located at the mid-height of the building (i.e., 56th story). It can be concluded that after enhancing the shear walls by embedded braces, Zone 6 is no longer the typical weak region in this building and the global collapse resistance, i.e., CMR, of Model B2 has been increased by 12.7% comparing to Model B1. Therefore, enhancing the shear walls in 78th-95th stories by embedded braces is an effective method to increase the collapse resistance of this supertall building. Note that the increased amount of steel due to the embedded braces is less than 0.1% of total steel consumption, which means that such an enhancement method is very cost-effective. In the final design, brace-embedded shear walls are indeed used in 78th-95th stories in the supertall building concerned. The earthquake-induced collapse analysis has been studied for many years and many of which have been performed at the theoretical level. However, such technologies have never been used in the seismic design of real world supertall buildings. In this study, an actual supertall building with a height larger than 500 m is investigated. With the earthquake-induced collapse analysis, the optimal seismic designs of this supertall building are conducted at the structural system level, the design parameter level and the component level. The following comments are concluded. (1) The optimal design of the structural system indicates that the fully-braced scheme results in lower cost and higher level of safety. The CMR of the fully-braced scheme is 14.8% higher than that of the half-braced scheme together with an 11.2% reduction in the material consumption. (2) The optimal design of key design parameters indicates that when the calculated modal base shear force of supertall buildings does not meet the code-specified requirement, the adjustment method of scaling the calculated base shear force to the minimum value for component design and story drift displacement evaluation will find a balance between the seismic collapse resistance and the overall construction cost. (3) The optimal design of structural components indicates that enhancing the shear walls in 78th-95th stories by embedded braces has a significant effect on increasing the seismic collapse resistance of the supertall building. Specifically, the increased steel consumption is less than 0.1% of the total steel consumption, while the CMR is increased by 12.7%. Conclusively, the earthquake-induced collapse analysis can quantitatively study the influence of different design factors on the safety of the building. Given more and more supertall buildings to be constructed with new types of structural systems and components, the collapse analysis presented in this study will provide important references for both seismic design of similar supertall buildings and future collapse resistance research. The authors are grateful for the contribution from Wankai Zhang, Bin Liu, Wuhui Qi and Weibiao Yang in establishing the FE models in this work. The authors are also grateful for the ﬁnancial support received from the National Natural Science Foundation of China (No. 51408034), the Beijing Natural Science Foundation (No. 8142024) and the Fundamental Research Funds for the Central Universities (No. 2014JBM078 and No. 2015RC057). Akbas B, Sutchiewcharn N, Cai W, Wen R, Shen J. 2013. Comparative study of special and ordinary braced frames. The Structural Design of Tall and Special Buildings 22(13): 989-1022. ASCE. 2010. Minimum design loads for buildings and other structures (ASCE/SEI 7-10): American Society of Civil Engineers, Reston, Virginia. Burton H, Deierlein GG. 2013. Simulation of seismic collapse in nonductile reinforced concrete frame buildings with masonry infills. Journal of Structural Engineering 140(8): A4014016. Cengiz EY, Saygun AI. 2007. Determination of collapse safety of shear wall-frame structures. Structural Engineering and Mechanics 27(2): 135-148. CAECS. 2015. Code for anti-collapse design of building structures (CECS 392:2014). China Association for Engineering Construction Standardization. China Planning Press: Beijing, 2015. CMC. 2010a. Code for Seismic Design of Buildings (GB50011-2010). China Ministry of Construction, China Architecture and Building Press: Beijing, China. CMC. 2010b. Code for Design of Concrete Structures (GB50010-2010). China Ministry of Construction, China Architecture and Building Press: Beijing, China. CTBUH. 2015a. 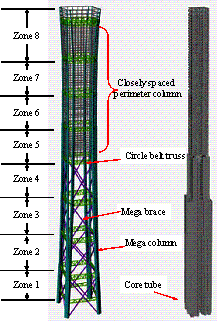 CTBUH Height Criteria. Council on tall buildings and urban habitat. http://skyscrapercenter .com/interactive-data.[2015.03.08]. FEMA. 2009. FEMA P695: Quantification of building seismic performance factors. Federal Emergency Management Agency, Washington DC, 2009. Gu XL, Wang XL, Yin XJ, Lin F, Hou J. 2014. Collapse simulation of reinforced concrete moment frames considering impact actions among blocks. Engineering Structures 65: 30-41. Guan H, Loo YC. 1997. Layered finite element method in cracking and failure analysis of beams and beam-column-slab connection. Structural Engineering and Mechanics 5(5): 645-662. Han LH, Zhao XL, Tao Z. 2001. Tests and mechanics model for concrete-filled SHS stub columns, columns and beam-columns. Steel and Composite Structures 1(1): 51-74. Haselton CB, Baker JW, Liel AB, Deierlein GG. 2011. Accounting for ground-motion spectral shape characteristics in structural collapse assessment through an adjustment for epsilon. Journal of Structural Engineering 137(3): 332-344. Jiang Q, Lu XZ, Guan, H, Ye XG. 2014. Shaking table model test and FE analysis of a reinforced concrete mega-frame structure with tuned mass dampers. The Structural Design of Tall and Special Buildings 23(18): 1426-1442. Lan W, Ma J, Li B. 2015. Seismic performance of steel-concrete composite structural walls with internal bracings. Journal of Constructional Steel Research 110: 76-89. Lignos DG, Krawinkler H, Whittaker AS. 2011. Prediction and validation of sidesway collapse of two scale models of a 4©\story steel moment frame. Earthquake Engineering & Structural Dynamics 40(7): 807-825. Lu XZ, Lu X, Guan H, Zhang WK, Ye LP. 2013a. Earthquake-induced collapse simulation of a supertall mega-braced frame-core tube building. Journal of Constructional Steel Research 82: 59-71. Lu X, Lu XZ, Guan H, Ye LP. 2013b. 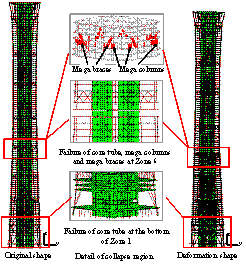 Collapse simulation of reinforced concrete high-rise building induced by extreme earthquakes. Earthquake Engineering & Structural Dynamics 42(5): 705-723. Lu X, Lu XZ, Guan H, Ye LP. 2013c. Comparison and selection of ground motion intensity measures for seismic design of super high-rise buildings. Advances in Structural Engineering 16(7): 1249-1262. Lu X, Ye LP, Lu XZ, Li MK, Ma XW. 2013d. An improved ground motion intensity measure for super high-rise buildings. Science China Technological Sciences 56(6): 1525-1533. Lu X, Lu XZ, Ye LP, Li MK. 2014. Influence of minimum base shear force on the collapse resistance of supertall buildings. Proceeding of 10th U.S. National Conference on Earthquake Engineering, Earthquake Engineering Research Institute, Anchorage, AK, 2014. Lu X, Lu XZ, Zhang WK, Ye LP. 2011. Collapse simulation of a super high-rise building subjected to extremely strong earthquakes. Science China Technological Sciences 54(10): 2549-2560. Lu XZ, Ye LP, Ma YH, Tang DY. 2012. Lessons from the collapse of typical RC frames in Xuankou School during the great Wenchuan Earthquake. Advances in Structural Engineering 15(1): 139-153. Lu XZ, Xie LL, Guan H, Huang YL, Lu X. 2015a. A shear wall element for nonlinear seismic analysis of supertall buildings using OpenSees. Finite Elements in Analysis and Design 98: 14-25. Lu XZ, Li MK, Guan H, Lu X, Ye LP. 2015b. A comparative case study on seismic design of tall RC frame-core tube structures in China and USA. The Structural Design of Tall and Special Buildings 24(9): 687-702. Mahin S; Lai JW, Schoettler M; Wang SS. 2015. Seismic assessment and retrofit of a 35 story steel building having pre-Northridge connections. The 2nd Conference on Improving the Seismic Performance of Existing Buildings and Other Structures, San Francisco, California, 2015. Mattern S, Blankenhorn G, Breidt M, Nguyen V, Hohler S, Schweizerhof K, Hartmann D, Stangenberg F. 2007. Comparison of building collapse simulation results from finite element and rigid body models. IUTAM Symposium on Multiscale Problems in Multibody System Contacts, 2007; IUTAM Bookseries Volume 1: 257-267. Moon KS. 2014. Studies on various structural system design options for twisted tall buildings and their performances. The Structural Design of Tall and Special Buildings 23(5): 319-333. Qian K, Li B. 2014. Dynamic disproportionate collapse in flat-slab structures. Journal of Performance of Constructed Facilities B4014005. Salem H. 2011. Computer-aided design of framed reinforced concrete structures subjected to flood scouring. Journal of American Science 7(10): 191-200. Sengupta P, Li B. 2014. Seismic fragility evaluation of lightly reinforced concrete beam-column joints. Journal of Earthquake Engineering 18(7): 1102-1128. Sivaselvan MV, Reinhorn AM. 2006. Lagrangian approach to structural collapse simulation. Journal of Engineering mechanics 132(8): 795-805. Sun LM, Zhou C, Qin D, Fan LC. 2003. Application of extended distinct element method with lattice model to collapse analysis of RC bridges. Earthquake Engineering & Structural Dynamics 32(8): 1217-1236. Tall Buildings Initiative (TBI). 2010. Guidelines for performance-based seismic design of tall buildings. Pacific Earthquake Engineering Research Center, College of Engineering, University of California, Berkeley. Tavafoghi A, Eshghi S. Evaluation of behavior factor of tunnel©\form concrete building structures using Applied Technology Council 63 methodology. 2013. The Structural Design of Tall and Special Buildings 22(8): 615-634. Worakanchana K, Meguro K. 2008. 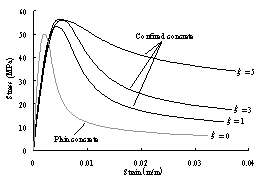 Applied element method for nonlinear analysis of reinforced concrete structures under fault action. Seisan Kenkyu 60(3): 208-211. Zareian F, Krawinkler H. 2007. Assessment of probability of collapse and design for collapse safety. Earthquake Engineering & Structural Dynamics 36(13): 1901-1914. Zhang J, Cao WL, Yu C, Dong HY. 2014. Shake table test of reinforced concrete wall structure with concealed bracings. Proceedings of the ICE-Structures and Buildings, 167(10): 598-609.